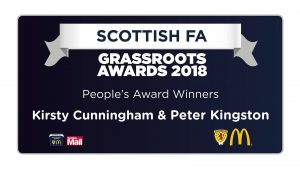 The club is delighted to announce that Kirsty Cunningham was recognised in the SFA Roll of Honour for the People’s Award at the Scottish FA’s Grassroot awards ceremony recently. 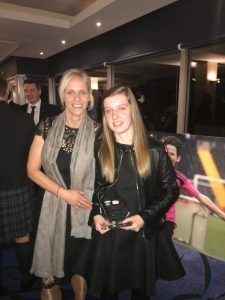 Kirsty, pictured here with Scotland’s Women National Team coach Shelley Kerr, is head of the hugely successful West Park’s Girls Academy which is continuing to grow from strength to strength. The award caps a landmark few years for both Cunningham and the club’s girl’s academy, which had just one playing group – Fun Fours at under-nine level – when Cunningham took charge as a teenager. Since then, she has overseen the development of the women’s section into a fully-fledged pathway, with over 70 players in teams ranging from under-nines through to a competitive senior team. Still just 24, Cunningham’s commitment to the women’s game has seen her championed as a driving force in grassroots football. 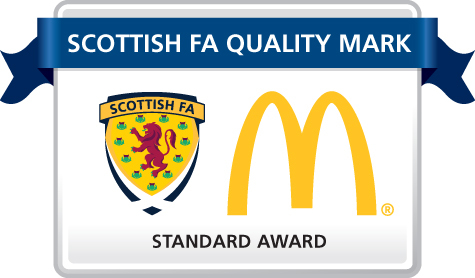 In addition to often leading four training sessions per week as well as her administrative commitments, she has also recently completed her C Licence and has set her sights on working her way through the programme of coaching badges over the coming years. Her pathway has borne fruit over recent seasons; the club’s under-13s claimed league glory in 2017/18 under the guidance of Cunningham – with the majority of the team having been part of Cunningham’s ‘originals’ – whilst one of the team’s stars, Clare Goldie, was invited to attend Central regional under-14s squad training.